For just the sixth time since 1992 the Packers had a new quarterback under center. 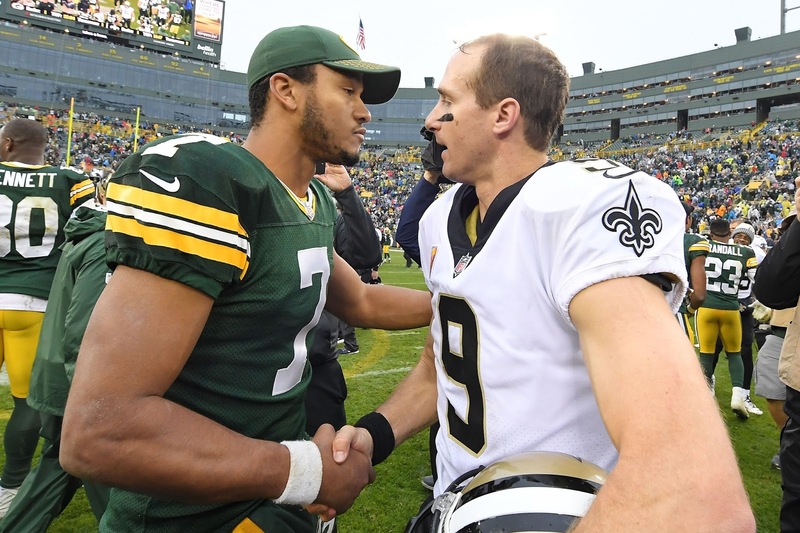 Brett Hundley made his first career start last Sunday in Lambeau and the Packers fell to the Saints 26-17. The Packers got off to a promising start, forcing two interceptions in their own territory. Green Bay was spurred by their up-and-coming, rookie running back Aaron Jones who racked up 131 yards and touchdown in the game, including a big TD run on the Packers first possession. For Packer fans, there was a sense of hope going into halftime leading the Saints 14-7. Hundley struggled through the air in his first start completing just 12 of 25 passes. However the young quarterback did prove to be a mobile threat out of the pocket. Hundley ended up scoring on a 14-yard run in the second quarter to give the Packers a 14-7 lead and finished the game with 44 rushing yards on 3 attempts. Being mobile helped, but Hundley could not seem to connect with his receivers on the deep ball. The first-time starting quarterback threw for just 87 yards in the entire game. Many fans expected the Packers to be more conservative without Aaron Rodgers under center and even for Mike McCarthy it was very conservative. The Packers ran the ball just as much as they threw the ball. Green Bay had 25 pass attempts and 24 rushing attempts in the game. For a career debut, keeping it as simple as possible is ideal. However, there’s not a ton of time for McCarthy to wait for Hundley to gel with the offensive playbook. The nonexistent pass-game can be summed up by the last play of the game for the Packers offense when Hundley threw a ball 10 feet in front of Martellus Bennett and into the hands of Kenny Vaccaro for an interception to solidify the loss for Green Bay. Hopefully this bye week will help this offensive staff regroup and prepare for the next couple of games. The Packers have the Lions and Bears coming up, which I am already talking myself into the Packers winning these games. Mike McCarthy said he was all in on Brett Hundley because he has “three years invested,” but it did not feel like that on Sunday. The inexperience showed on Sunday both offensively and defensively. For the second time this season, the Packers defensive staff and the defensive play caller on the field were not in communication which resulted in the Packers playing a snap with only 10 players on the field. Ha Ha Clinton-Dix is just beginning the role of on-field play caller because of Morgan Burnett’s continued injury absence. The defense proved it can force turnovers in key moments after the Packers forced Drew Brees to throw two interceptions deep in the Packers territory. However, Brees still played well enough to defeat the Rodger-less Packers by throwing for 331 yards and scoring two TDs, one throwing and one rushing on a QB-sneak from the one yard line. The defense also gave up big plays that led to the Saints tandem of backs to rush for 161 yards including a rushing TD from Mark Ingram. It was a very odd game because I think most people went into the game feeling very little hope in this Packers team. But with the 14-7 lead, it started to look like the Packers had a chance to get out of there with a victory. But a multitude of things happened that caused that feeling to change. The obvious being the limited playbook being used with a new quarterback. But the defense has to step up a little more if the Packers are going to have a shot. They played well enough to win with Aaron Rodgers, but clearly it was not enough with Brett Hundley.